R. Welling can't get a USB device to work properly in his computer. "What could be wrong?" Clearly, something is broken. But is it hardware, software, the device or the computer? That's going to take some experimentation. First, let's get the obvious out of the way: Unplug the device, then plug it again. Did that fix the problem? If not, unplug it again, reboot your PC, and then plug it in again. Did that help? How about trying another port? No? Well, it was worth a try. Since the problem persists, let's get on to more serious tests. Try the same device on another PC, and try another USB device on your PC. If the device fails to work on both PCs, you have a defective device. You might be able to fix the problem with a driver update. USB devices are supposed to install their own drivers when you plug them into a PC, but occasionally that doesn't work. Go to the device manufacturer's website and see if there is a Windows driver available. If you there is, download and install the driver. If that won't solve the problem, accept that you've got a defective device. If it's new, go hunting for the receipt try to get your money back. If the device works on another computer, but not on yours, yet other devices do work on your PC, try installing the driver as described above. If that doesn't work, or if all devices fail on your PC, the problem is with your computer. But is it a hardware or software problem? Just to be safe, create a restore point. In the Start menu's Search field, or in Windows 8's Search charm, type restore point, and select Create a restore point. Click the Create button and follow the prompts. Don't continue until the restore point has been created. Open Device Manager. In the Start menu's Search field, or in Windows 8's Search charm, type device, and select Device Manager. 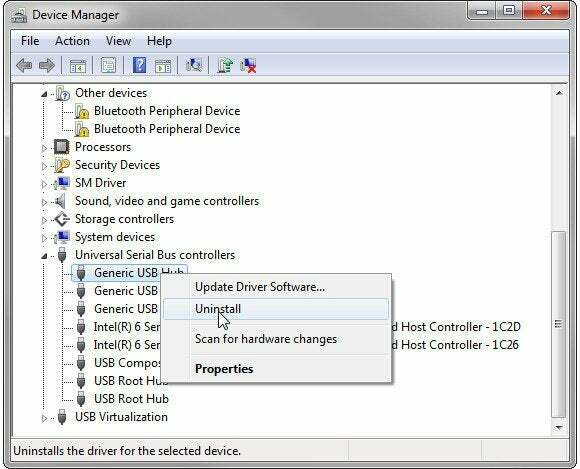 Once in Device Manager, go to the Universal Serial Bus controllers section. Right-click the first listing and select Uninstall. Repeat for all of the others. When you're done, reboot. Windows will automatically reinstall the drivers. Warning: If you're using an external keyboard and mouse, uninstalling one of the USB devices may effectively freeze your PC. If this happens, manually reboot the PC and everything will be okay. If none of this works, you may have a defective USB port. At this point, I suggest you bring your PC to a professional.